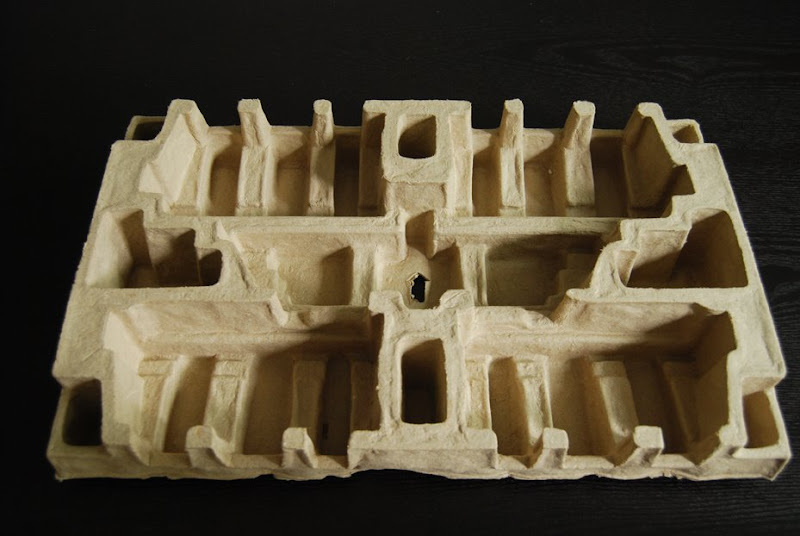 I am going to recycle a cardboard box that was used for an electrical appliance packaging. Fortunately, this open box has 12 compartments (for 12 months) which we will be needing. And the best thing is, this box has other lovely small compartments that I can decorate with. So, keep your 'trash'. They'll come in handy one day. 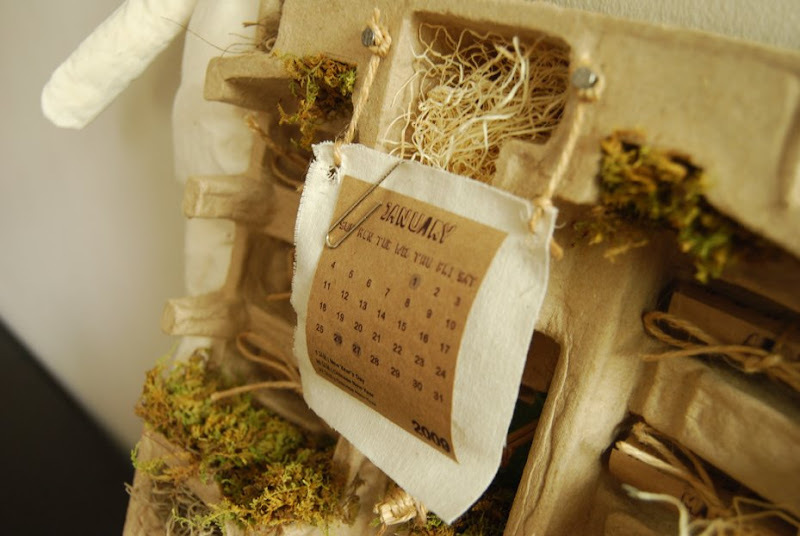 Once you've found your perfect box to work on, draw out a concept of how you want the calendar to look. The concept for this tutorial is nature. 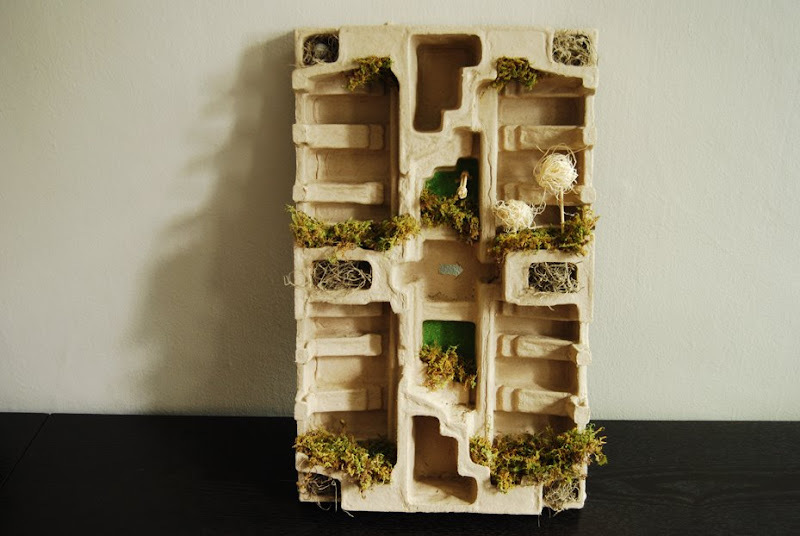 Hence I've decided to use recycled and green materials that conjure up the idea of 'nature'. 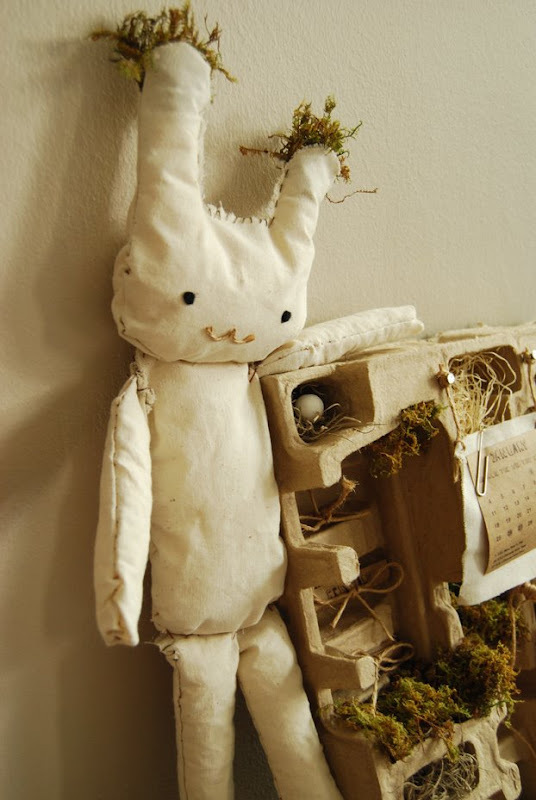 I will also be creating a simple yet adorable rag doll with moss sprouting out of its ears. This character will give a touch of humour to the final piece. Give yourself a few days to think through if neccessary. Ideas don't usually come in a split second. Rather, they develop overtime. 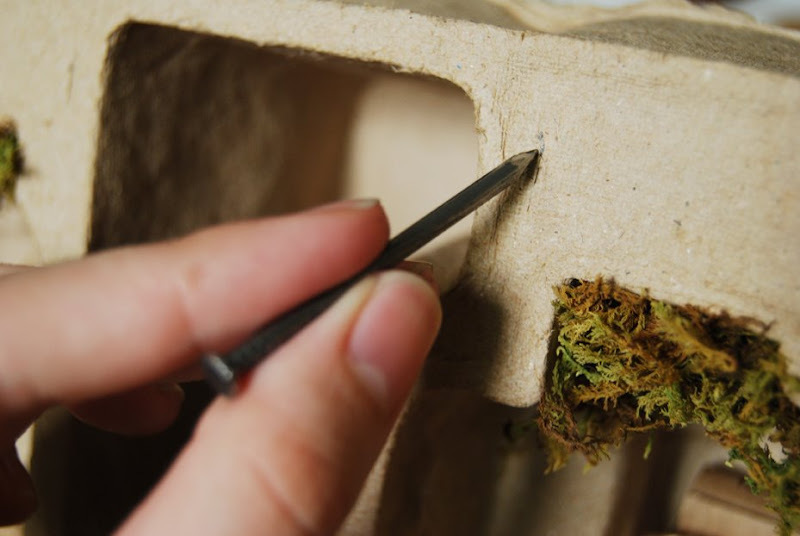 Stuff some decorative moss into the smaller compartments to create tiny bird nests. Roll the clay into small egg-shaped balls. 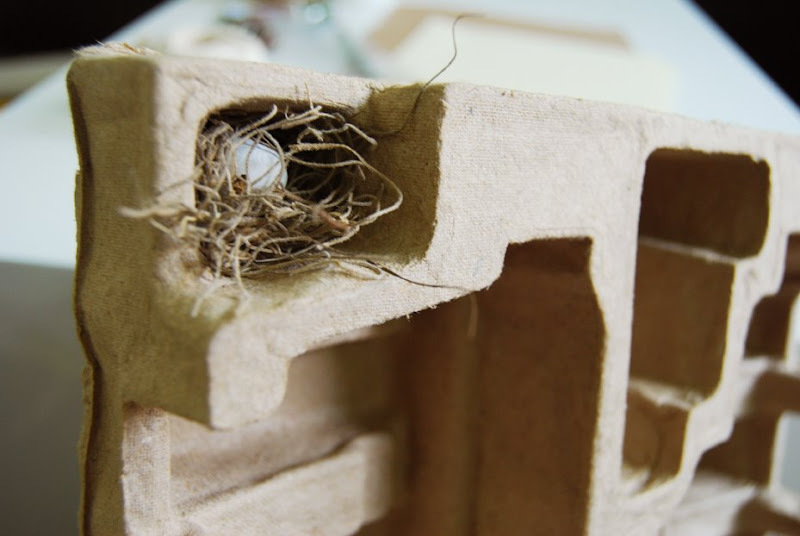 Let dry then glue them into these nests. 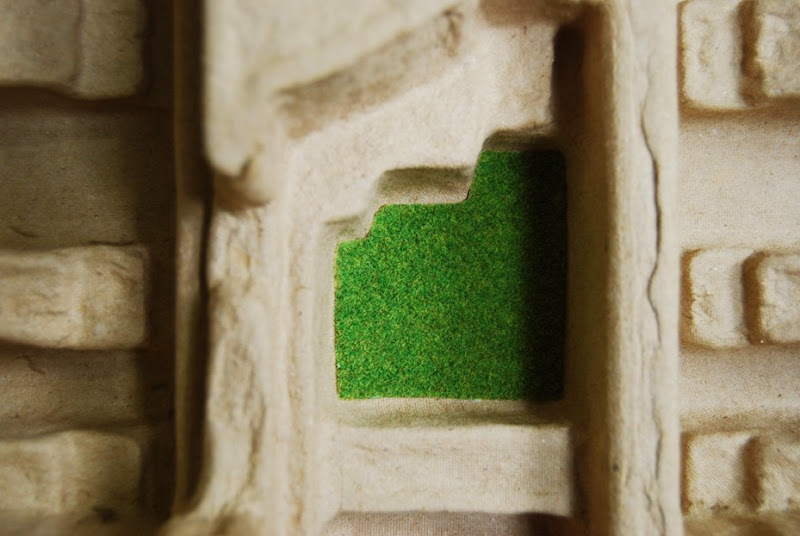 Next, cut out some carpet grass and stick onto the 'walls' of some compartments. If you're wondering how I managed to get the exact carpet size for this tricky shape, I actually reversed the box and traced out the irregular shape then used that as a template for the carpet grass. 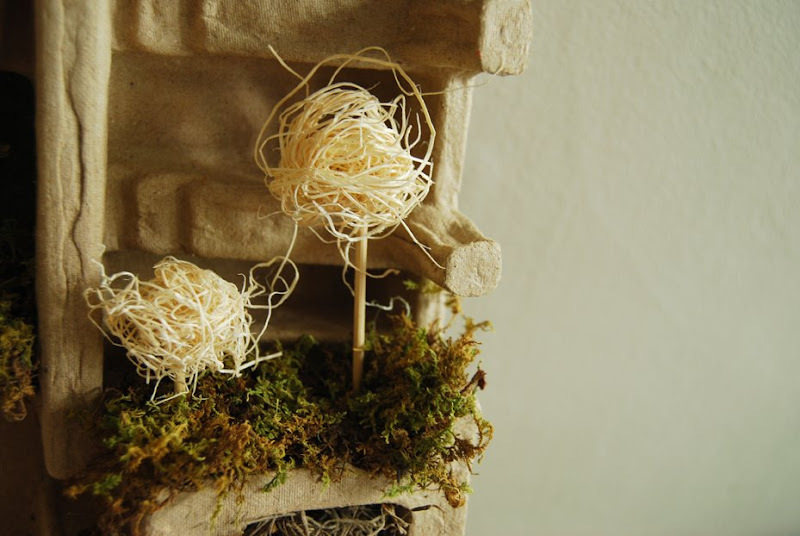 Use your creative instincts to create a garden like landscape for along the rims or ledges of the box. I've glued lumps of moss on to make them look like grass platforms. Keep decorating until you are satisfied with the look of the grass-scape. Make some trees. 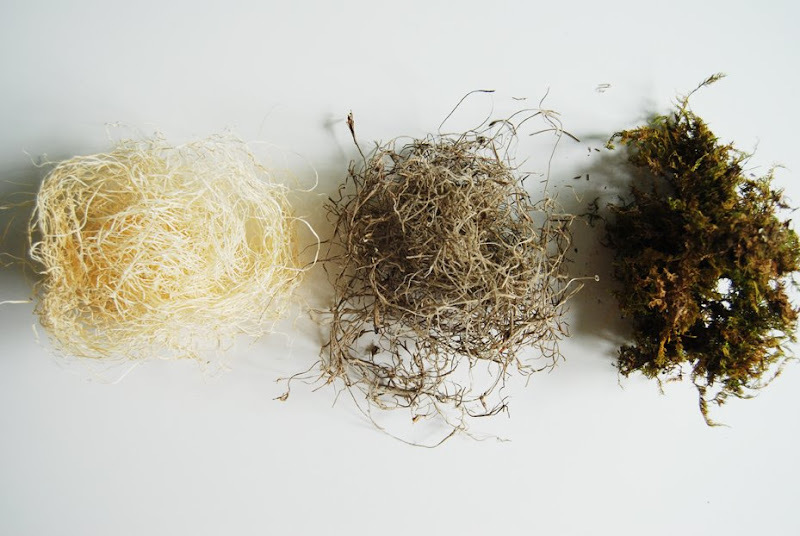 Roll some hay into a ball and glue onto sticks. 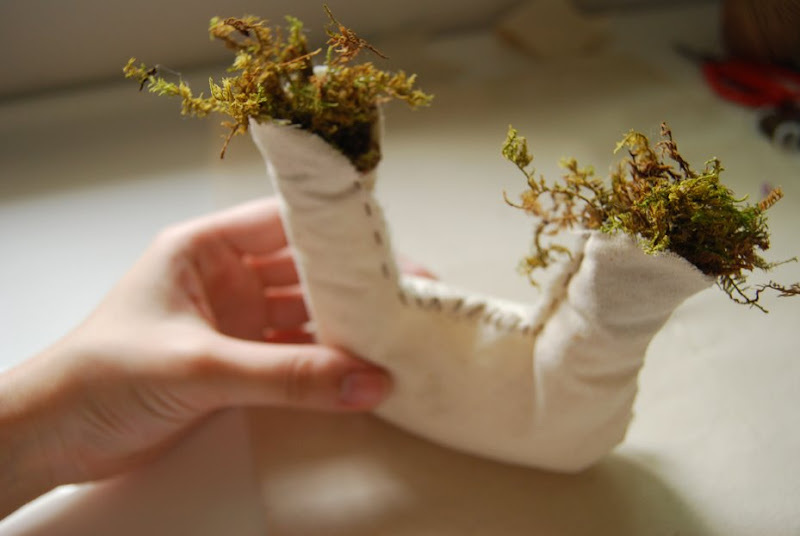 Let dry and glue the trees into the moss beds. Now for the calendar, grab any reliable 2009 calendar from the Internet etc. We will be needing the dates as reference. 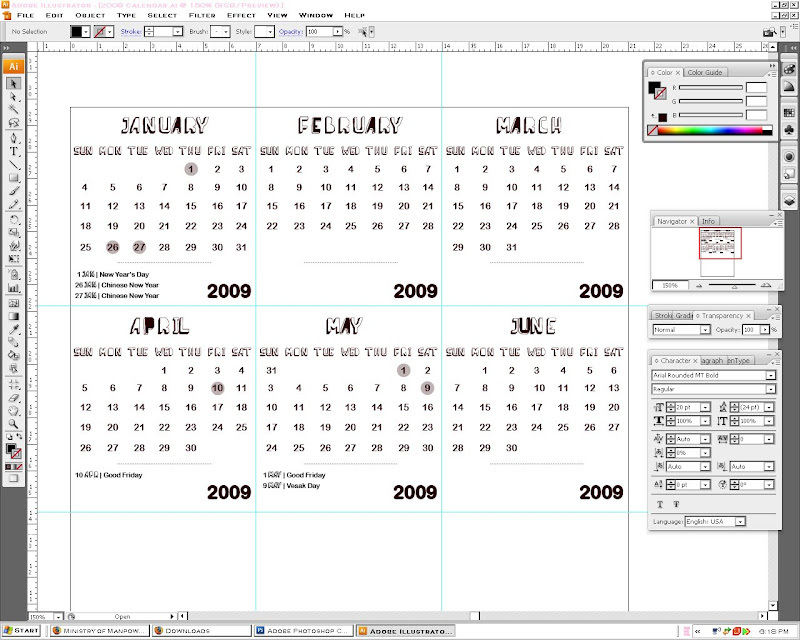 I am going to digitally create a new look for the calendar using Adobe Illustrator. Create a new A4 canvas. Divide it into 12 equal squares using the Ruler guide. Choose the fonts you want to use and copy the dates carefully from the reference material. You can highlight the important dates for that month and list them down on the footer. Be creative. Play around with the layout and design. Once you are satisfied with the look, double check again. You don't want any wrong dates that will eventually confuse you : ) Now print out your masterpiece onto a piece of A4 construction paper. I've used a brown paper that will fit nicely into my nature theme. Cut out the 12 months squares. Here's the interesting part. We are now going to 'fix' these 12 squares into the 12 compartments of the box. Used a penknife to indent two slits in each compartment. Take a brown string, wring through these slits from the back. 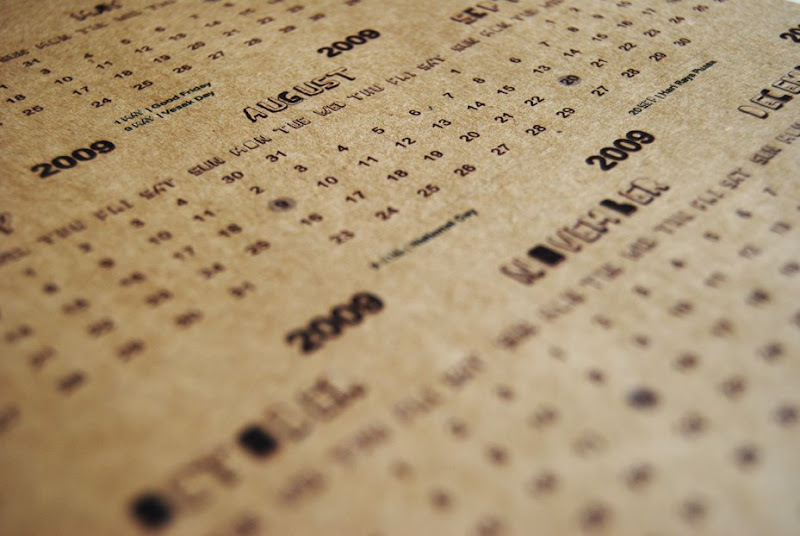 Next, roll the monthly calendar outwards so that the name of the month can be seen from the outside. 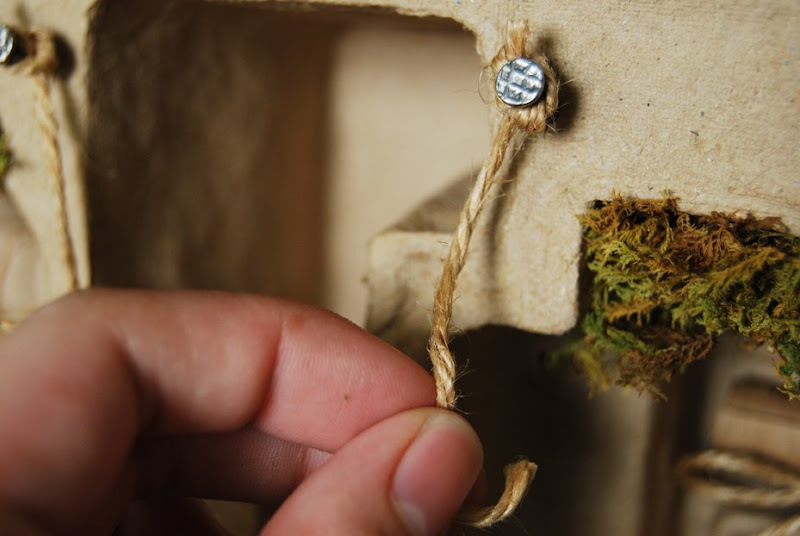 Place into the compartment and tie it up with the brown string. Repeat for the other calendar months. Leave the January calendar untied. We will be showcasing this month's calendar on a fabric billboard swing. 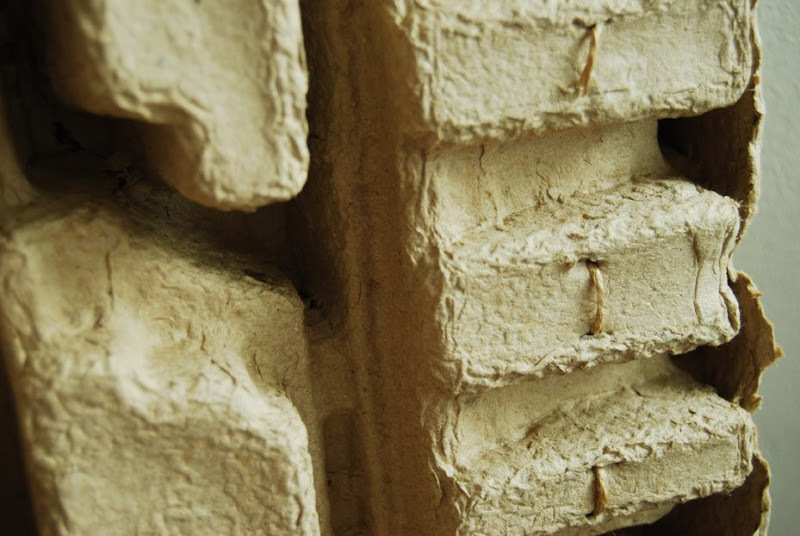 For the billboard, cut two slits on the cardboard box and fix a nut and bolt or nail into each slit. Tie brown strings around both nails and let the strings dangle. Measure and cut out a 9.5 cm piece of square fabric. Punch or cut out two holes at the top corners. Tie the dangling brown strings through the holes on the fabric. Then clip the January calendar onto the billboard fabric using a paper clip. There you have it, a swinging billboard calendar showcase. Now for the rag doll feature. Sketch out a few adorable characters. 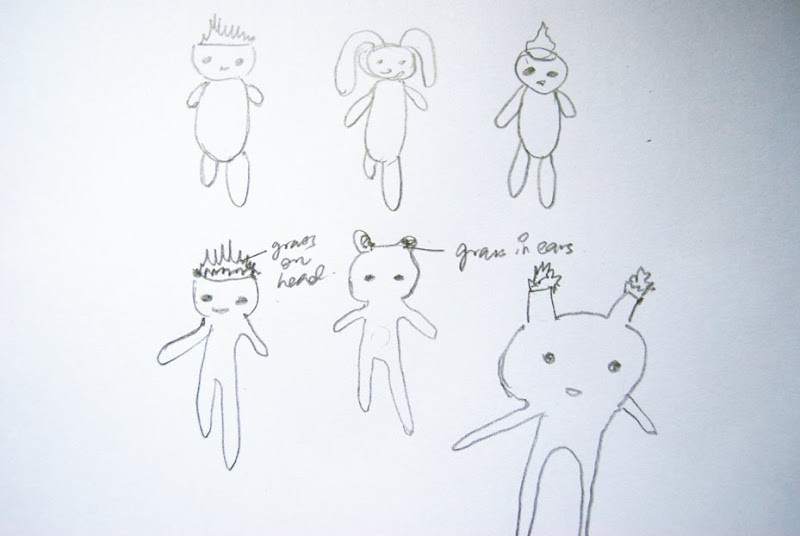 From my sketches, I've decided to go with the one that looks like a rabbit rag doll. Think about how you want the finish of the rag doll to look like. Do you want a clean finish to it or leave it ragged and raw. 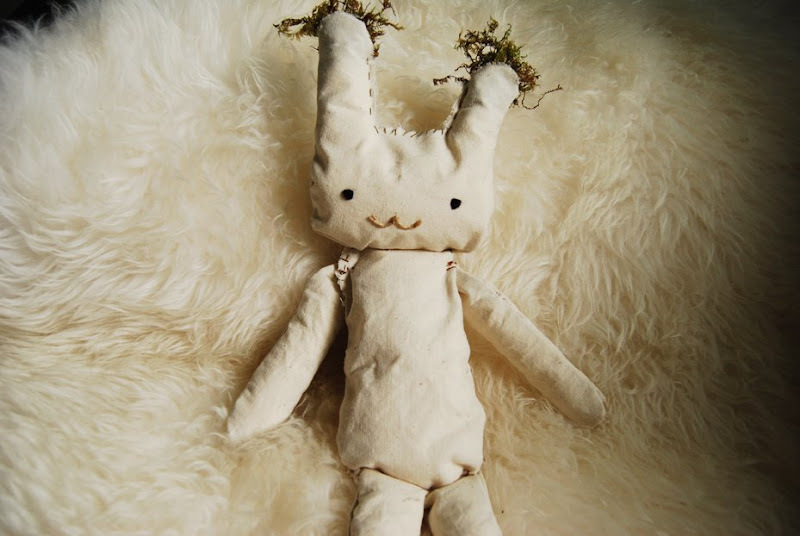 Your decision will determine how you will be sewing the doll. For this tutorial, I am following a rough look for the whole concept, so I will be sewing with my hands. I am going to rely on my imperfect stitching to create a ragged look for the doll. Firstly, fold the chosen fabric in two. Using freehand, draw out the head, body, hands and legs of the doll. Here's how you do the head of the doll in detail. 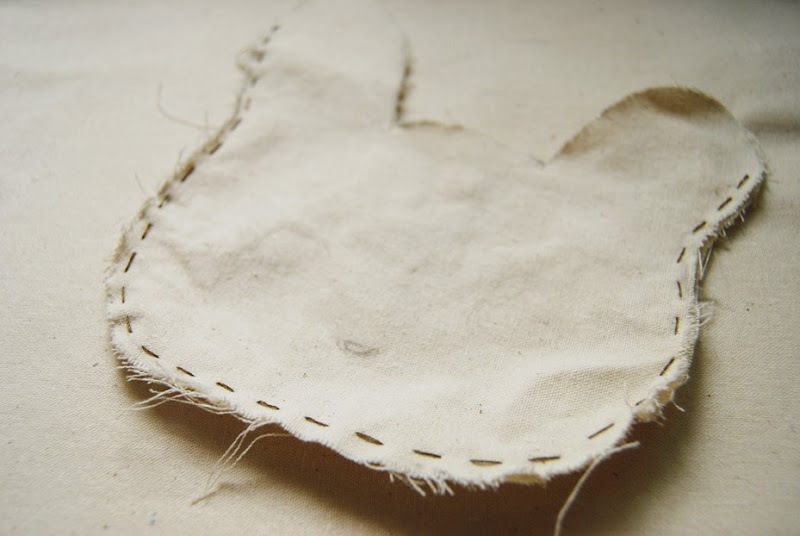 Once you got the right shape, cut out the fabric and stitch it on the sides. Leave the top open. Once that's done, reverse the fabric inside out. 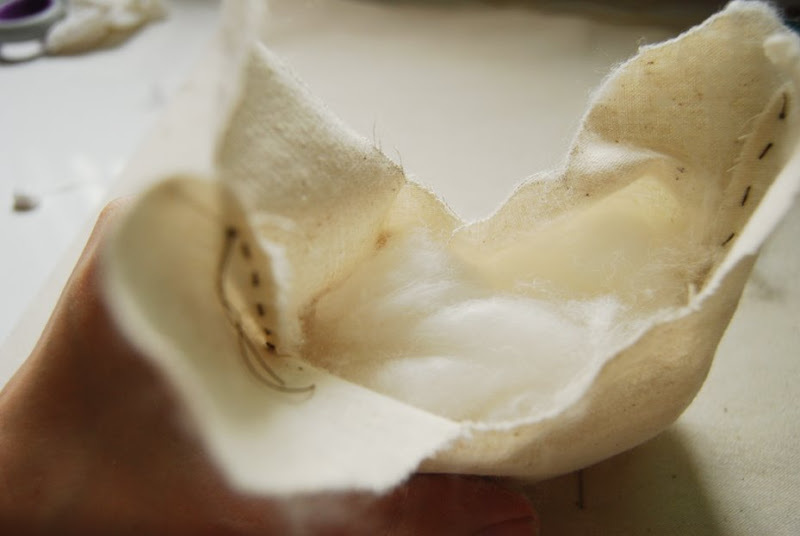 Fill in the cotton wool then stitch up the 'brain', leaving the ear holes open. 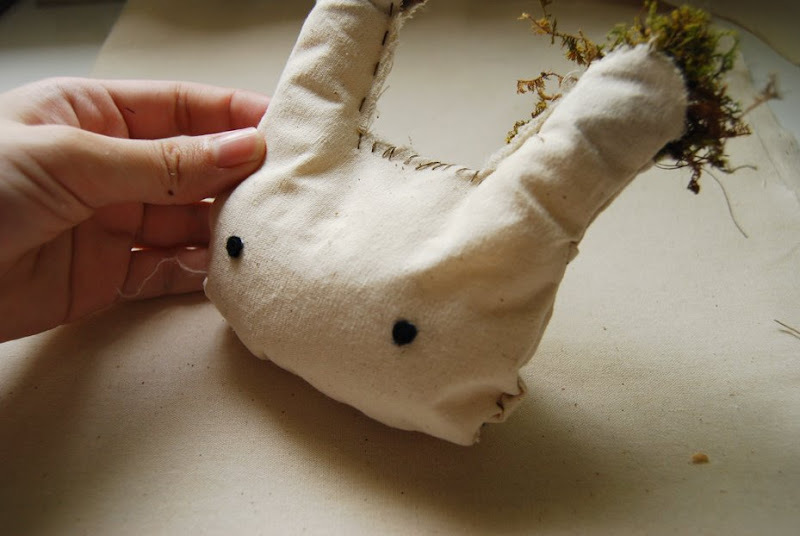 Stuff some decorative moss into the ears of the rabbit rag doll. 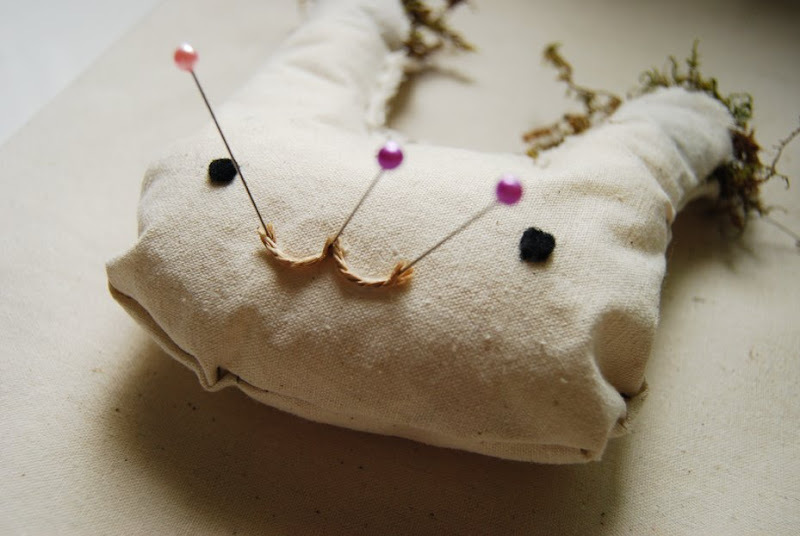 Use a hole puncher to punch out two small black eyes from the felt wool square. Stick the eyes on nicely. 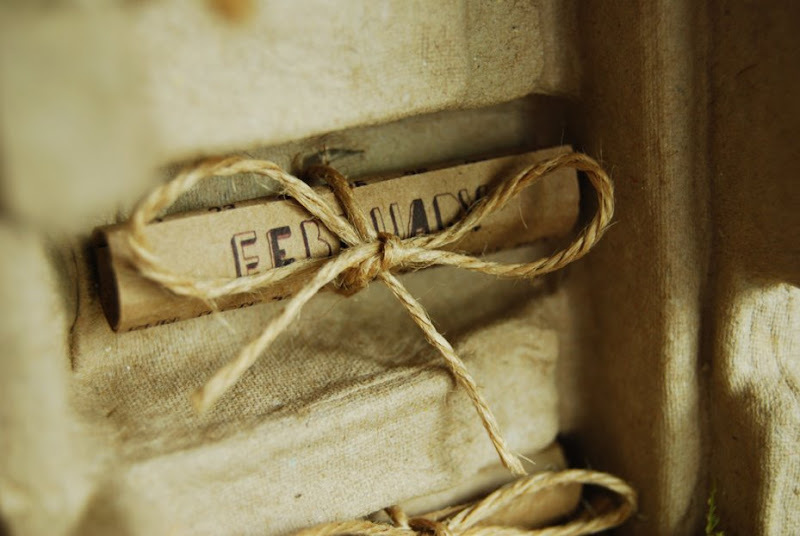 For the mouth, cut two short pieces of brown strings, curl it and stick on with glue. Use some bobby pins to hold these down while the glue dries. 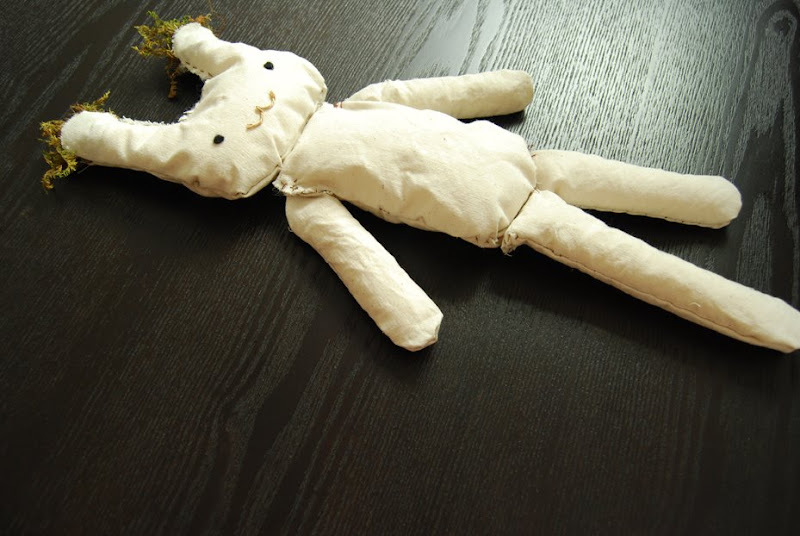 When the rag doll is finally done, pin it onto the frame of the cardboard box. Hang this up on your wall or leave it on a shelf. Enjoy : ) May the coming year ahead be a fruitful and meaningful one for everyone. This art is great! Like all of it! omg you put so much work into that, it looks so great though!! gosh that is so beautiful, i'll be back to see what else you get up to. I love this so much- you are so very clever!!! 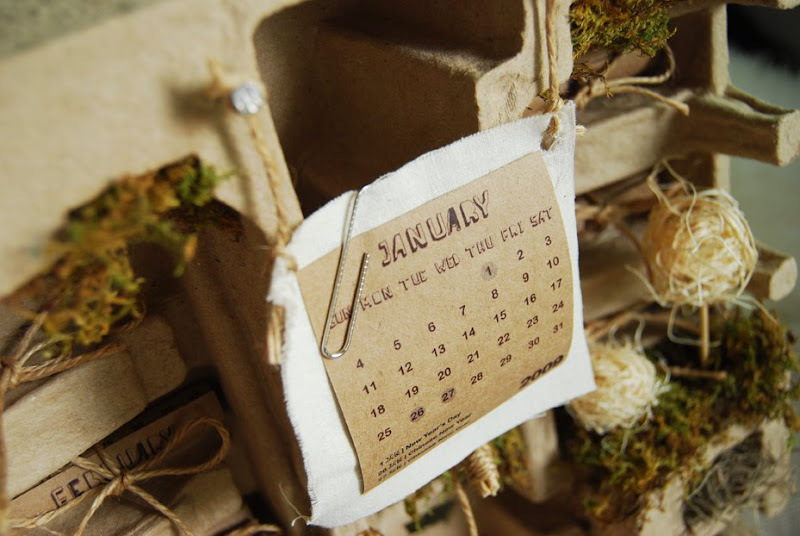 Your calendar is so magical and natural--I'm in love! Thanks for sharing your creative process! too awesome~!! Can i buy it ?? great project! 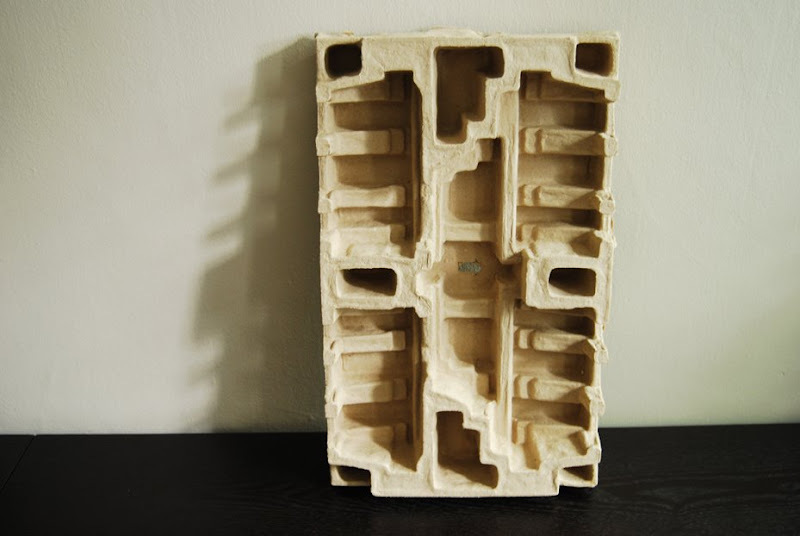 I have a few similar packaging cartons, saved for the odd shapes. This gives a starting point with some good ideas to adapt. awesome design! it looks so cute! craft the bunny is the hardest part. Cheapest Diablo 3 goldshelf. Listed here is a not one but two part tutorial that we're sharing with you men, within wish that it'll stimulate you to develop new things out of the ordinary. Immune various types affixes First relatively rare, not additive Secondly get multiplied, it is not a 100% reduction; this last affixes to get less than (expensive or not available), in full anti-and physical affixes The fourth choice, generally the second choice or choose damage reduction and control of the Department of affixes, the third choice is the strength or armor. That's amazing, i like your article style, you really do me a favor on this issue. Bestway to get traffic to your site is to buy traffic. But you would to have targeted traffic in order to earn money. You can visit some of the best web page on this topic by searching on Google. So wonderful! ~I really love the excellent site~~It can teach lots of useful information~ I also think it should Günstige Handys ohne Vertrag be shared by everyone~~And the picture also be beautiful! ~In a word, it suit itself! 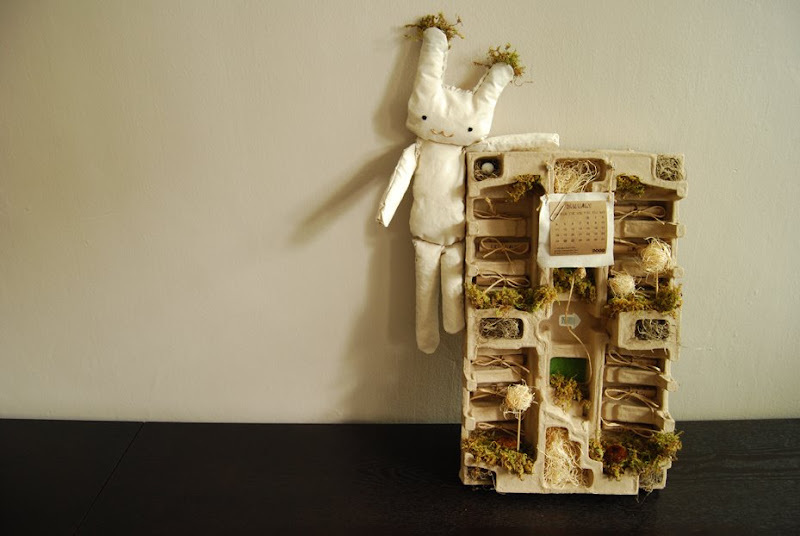 Gee, this is such an amazing project, love how you made something so wondrous outta such basic parts, I am most amazed by your creation and work procedure, the way you pick out that you want to create something connected to nature outta cardboard and just go and do it and that stuffed plushie thing holding it in that elegant pose is just stunning. did you knoew you can buy rs gold to create anything in rs as well? it's that simple, the best gear, the fanciest house, the best looking customizations, they all can be yours, you can mix and match them into amazing designs, so what is there to wait?